As a painter, the paintbrush has been your best friend. Right from the time when you just started off as a painter, it has been with you throughout your growth years. Plus, it has seen you develop from being an amateur to a professional. But now that you are a professional, don’t you think, you are a bit old to play with your paintbrush? Seldom so professional artists use paintbrushes to run down their imagination on canvas. And if you deem yourself to be a professional, too, it’s time you ditch that old friend and move on. But that’s impossible you say how to paint without brush after all? 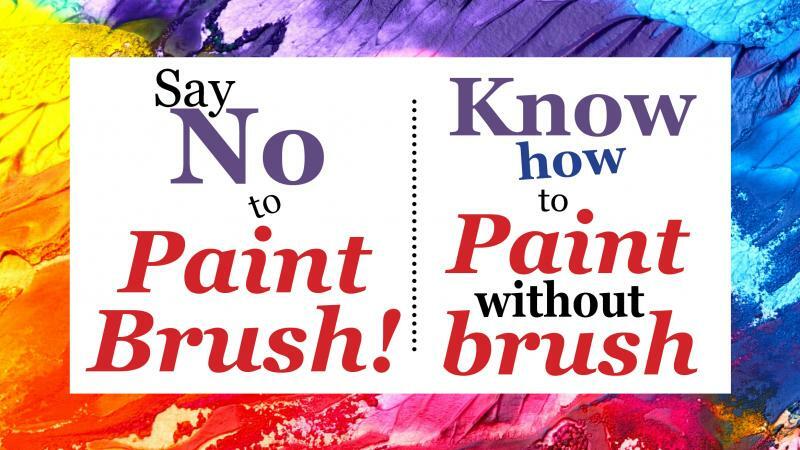 Painting without brush might seem like a tough task to you if you call yourself a painting novice. But it is not so much of a task if you are confident of the concept of your painting and know how to play around with your fingers a bit. Before you start painting, you need to be absolutely sure of what you are going to create. Though it doesn't matter whether you use a paintbrush or not, you must imagine your art prior to painting it on the canvas. If you are not even sure of what your composition would look like or what you want to start with, you won’t know what strokes you are going to use and what would be the best choice of tool to go about it. So, use your imagination and form a mental image of your composition. Notice if you want to go for an abstract composition that requires more smudgy strokes or a solid one that needs a lot of playing around with lines and straight strokes. Depending on what your idea of composition is, you can choose a palette knife or work with your fingers. There are multiple kinds of painting knives and palette knives available in the market which are suited for different purposes. If you paint in a lot of layers using a lot of paint, you can try out a palette knife. A palette knife is basically used to carve the paint which has been applied to a piece of paper or your canvas in thick layers and needs to be given a particular shape or definition. Palette knives come really handy when you are looking to add dimensions to your composition. You can go for a paint knife if you are afraid of getting your hands dirty and your artwork needs a lot of spreading the paint across the canvas. The paint knives find utility mainly in applying the paint to your paintings when you are trying to get a uniform consistency of it or a uniformly blended gradient of colors. Whether you use a palette knife or a paint knife, it entirely depends on the type of work you perform. If you visit any online painting gallery across any of the e-stores that sell painting online, you will find many examples where whole paintings have been completed without being touched with a paintbrush even once. There are several professional artists who like to use their fingers to paint instead of a brush. The one leverage of using your fingers instead of the brush comes as having more control over your strokes. You can very easily use your fingers to apply, blend, merge, and even out colors on your canvas. If you are painting abstract, shapeless forms, you can very well smudge the colors and mix them using your fingers. You can even block paint a given area using the pad of your hands to create a unique effect. Else, if you are painting a uniform, a single-colored composition like the skies or a water body, you can very effectively blend and straighten the paint out by uniformly stroking the region with your index and middle finger joined together. You can use your fingertips to smudge different colors to create a cloudy, cottony composition. If you are really looking forward to ditching your paintbrush and using other techniques of painting, you can also try taking online tutorials that teach painting with your hands. You can even use a piece of cloth or leather to paint a composition. There are several other painting tools like painting blades, painting rubbers, and painting buds available in the market. These tools help you move past that routine brush and experiment with your work. But that does not mean that you completely need to let go of the brush. You can use all of these tools in a combination using whatever is needed at any given time. With time and practice, you will notice a decrease in your urge to use a paintbrush while creating a fine art. So, don’t be afraid to experiment and keep exploring newer tools until you have mastered all of them.